Planning community trips was always so stressful for me, at least my first two years teaching. Each month, I'd think I should probably plan a community trip...but only ended up planning a few because other things always came up and I focused on those instead of trying to plan a trip. At the beginning of this year I decided, as a high school life-skills teacher, I need to make sure community trips were part of my curriculum. 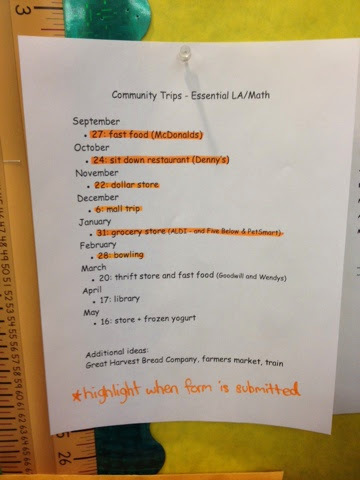 In August I planned a calendar of community trips I thought we could go on. In the beginning, I wanted to start with something simple, so it was just a short and sweet trip to McDonald's. Once my students had more exposure and were used to going on community trips, I figured they'd be able to handle more which is why towards the end of the school year I have us going to both a store and a nearby fast food restaurant in the same trip. And I have to mention that looks might be deceiving...this is not the same calendar I started out with in August. I would scratch things out and move trips around, but since I like things to look neat, I would then update it and print out a new one. I also like having this prepared ahead of time, because I then work on lessons that go with our community theme. Fast Food Restaurants: For McDonald's and Wendy's we used this fast food unit. We also spent time looking at their websites and their online menus. I created a visual menu from the dollar menu to help my students choose items while staying in their budget as well as a scavenger hunt in case we had some time to kill - you can see those things here. It was also helpful to use our environmental print Fast Food book and worksheets. Sit Down Restaurant: For Denny's we prepared by reading some books I had about sit-down restaurants. We looked at the Denny's website at their menu, logo, and location. We also practiced by having a restaurant in class with menu items of chips and pretzels. Afterwards, I created this book that my students continue to read. During language, I have my student identify restaurants in their community based on their logos. Dollar Store: The Dollar Tree website was great to look through and they had cool videos that we showed as well! I also really enjoy that at a dollar store, everything is a dollar, so it makes it easier for students to budget. We practiced picking out items and counting how many items we had to know how many dollars we needed, adding one dollar at the end for the tax. Stores: Since they were all right next to each other, we went on a trip to ALDI, Five Below, and PetSmart. I had students complete "research projects" like the ones found in my Store Environmental Print packet. The students had to trace the name of the store and then cut and glue items from ads I brought it or ones that we found online of things they could find at those stores. We also went through a PowerPoint of actual stores that I found on Google images, so students could get used to recognizing the logo on actual buildings. The materials I used to teach these three stores you can download here for free. We used this Taking Care of Pets unit to prepare for PetSmart. Bowling: More details to come in a post soon, but I used this bowling unit to help my students prepare for this trip. Update - read about our bowling preparation and trip here. Thrift store: I'll admit, I really wanted to play "Thrift Shop" for my students....but even the clean version sounds a little dirty, so I didn't feel comfortable enough doing it. Sad day! I hope to create materials that I can use next time for this trip, but for this time we just went on Google images and talked about the Goodwill logo and how you can buy "good" stuff at Goodwill. 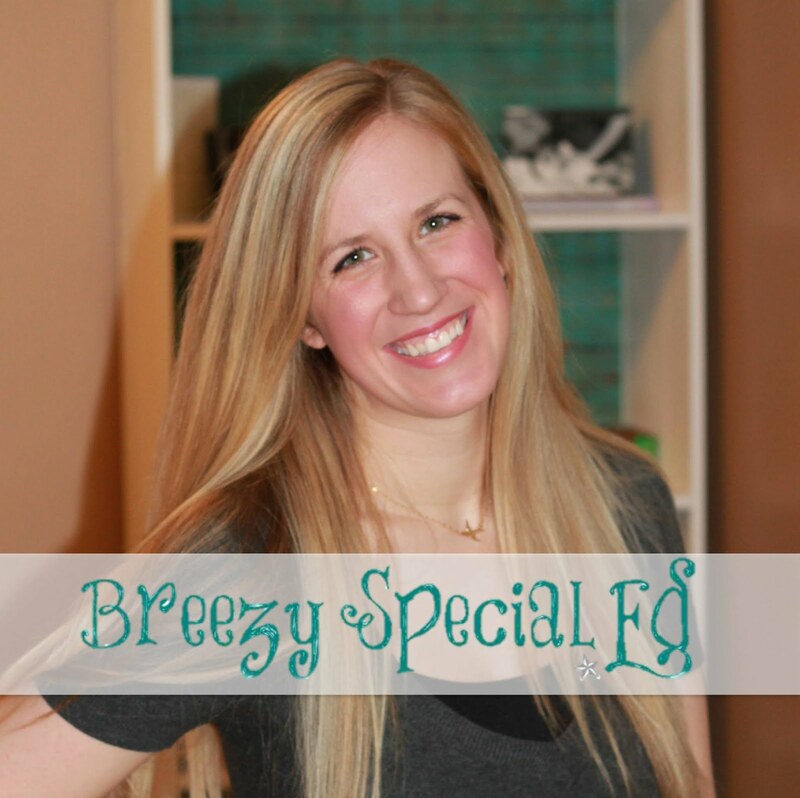 We discussed donated and buying things cheaper, and how they have a lot of different things there. My students are excited to look for video games. Update: Library - see post and materials HERE and Ice Cream trip - we used this unit! Now, when a new month comes up, I check my community calendar, see if there is any conflicts with the date I suggested and then fill out the necessary paperwork for that event. I don't have to "think" which is SO helpful! :) And therefore we guarantee that we will have a community experience each month. 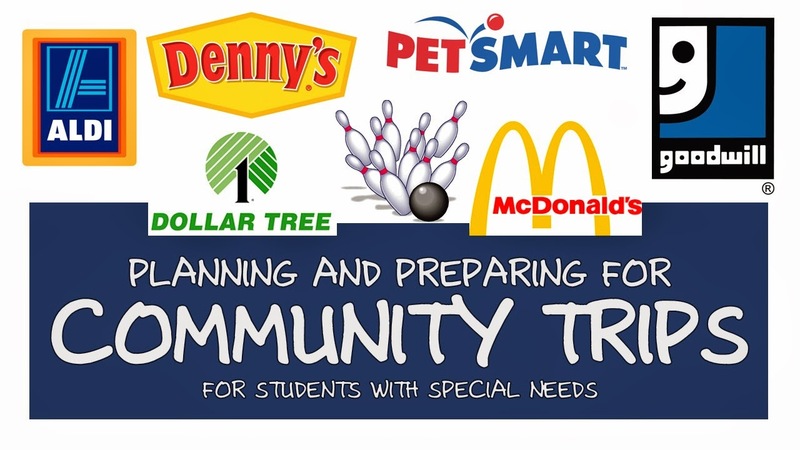 Need help preparing your students before they go out in the community? Grab this Community Trip bundle and receive 8 different trip units all planned for you! Thank you for this post!! I have been SO nervous to try a community trip with my kiddos. I love your fast food unit, though. Maybe we will try a trip to McDonalds to get our feet wet!! I love this post! Our school has set up a system where we send home a calendar in which each day for 2 hours (8:30-10:30) two students from each classroom (we have 3 intense interventions classes) and one instructional assistant from each class will be picked up by a bus (who gets paid for their extra time..cool!) and they go out to different locations. Places like you mentioned above, and in addition, when the weather allows it, we go to the Greenway and take walks or a nursing home. It's such a great opportunity for the students to practice social skills, (sneak in working on IEP goals ;)) and for the community to get to know the students and establish healthy relationships! The only downside is that as the teacher we have to stay in the building and teach, but get to see a "community outing report" on how each student did. Have a blast! What a great opportunity we have! Hi! I am beginning in a high school class next year and was wondering how long you spend on the trips? Also, how do you get there? The shortest ones (like McDonalds can be less than an hour) and others like the mall trip are almost all day! Most are around a couple hours though. What's awesome is no longer how long the trip is, we spent the whole month preparing for it, so hopefully they learned a lot! If we can walk we can! We usually do the train once. And a school bus for most.